This cards is really simple and can be used for an everyday card (birthday, thank you, best wishes, etc.) as well as a holiday card! The greeting used is from the new stamp set "Heard From the Heart" which includes a Christmas greeting as well. Here I did the greeting in Kiwi Kiss to make it subtle, however my guests did it in Chocolate Chip and it looked great! Large red flowers were bought at Michael's since I didn't have any large flowers left in my Pretties Kit to dye. Ink the Linen background stamp in Kiwi Kiss and stamp over entire card front. Then re-ink the background stamp and this time only stamp on part of the card front. Do again and stamp maybe in one of the corners of the card front, and so on, until you get the desired look. Stamp desired greeting at bottom, center (in Kiwi Kiss or Chocolate Chip). In the plaid designer series paper, punch 3 holes for 3 Ruby Red brads. Adhere/layer all panels. Adhere to card front. Adhere small flower to large flower using Mini Glue Dot. 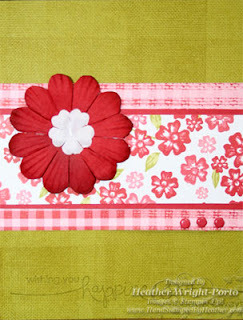 Adhere large flower to card front using Pop-Up Glue Dot. (if you are a new customer and don't already have a demonstrator or if you are already one of my customers).